The 18 seats available each week are highly coveted and sell out in seconds. I had tried for weeks to reserve a spot and had always been not fast enough. Two weeks ago, I was so determined to get in that I sat patiently in front of my computer for more than half an hour, constantly hitting the refresh button to see when I would get the email with the link to the reservations page. You can’t imagine my joy when I somehow managed to get in just in time (a matter of seconds really) to book 2 seats. Hubby was definitely going with me. After a closer look at the menu, which changes with the seasons and reflects Japanese traditional celebrations, I realized that it was meant to be, because my favorite dessert in the whole world, Mont Blanc, was listed there. Once I even had a Mont Blanc birthday cake, that’s how much I love it. Mont Blanc is a chestnut dessert that my grandmother used to make in the fall and it’s very popular in Japan. Oyatsuya is a very intimate experience of only 6 guests at a time. It takes approximately an hour and it takes place on the premises of an upscale Japanese restaurant, Sasaki. When I attended, the theme was 'Boar Day', a Japanese ritual (originally from China) that involves mochi sweets in the shape of a baby boar, which are considered helpful in warding off illness. The tasting began with roasted barley tea (served cold), a Japanese summer tea as Junko, Oyatsuya’s creator and chef, explained. It reminded me of Italian roasted barley coffee, which I enjoy very much. The first course was a savory onigiri with mushrooms served on a shiso leaf. Shiso is a type of mint, it reminds me of basil a little bit. The combination was very comforting and refreshing at the same time. 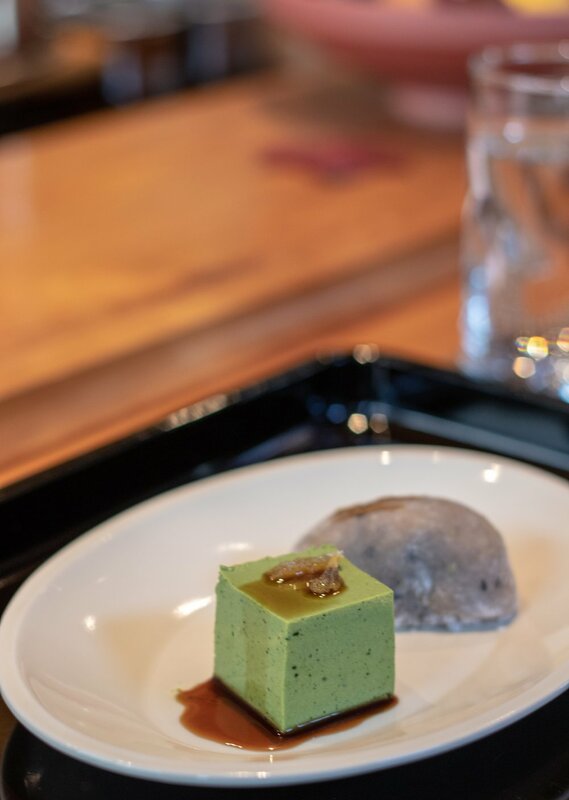 Then it was time for baby boar mochi and matcha bavarois, served together on the same plate. I was mesmerized watching Junko plate them, I could have watched her for hours. The mochi was very cute and incredibly intriguing, flavor and texture-wise, thanks to the walnuts in the filling and the azuki red bean paste both smooth and coarse. The matcha bavarois was exceptional, not too sweet and intensely matcha-flavored. Cold brewed gyokuro was served. Very umami and very flavorful. Next up was the mont blanc. Junko carefully sifted more chestnut paste on top of each mont blanc right before serving and finished with cocoa nibs. It was surprising thanks to the fruit carefully concealed right in the middle, underneath a mound of cream. I loved the crunchy contrast of the cocoa nibs. Last but not least, hojicha tea, served hot and a fun fruit salad made even more interesting by a variety of textures and temperatures. Asian pears, quince jelly, grapes (some of them frozen) and pomegranate arils. Very playful. What Junko is doing at her pop-up is exquisite. It’s a compelling experience that will tickle all your senses. To me it was so very special that I didn’t want to leave :-) I’ll definitely try to attend Oyatsuya in other seasons and see where Junko’s creativity and art - because that’s really what it is - takes me. Disclaimer: I did not receive any compensation by any of the brands or businesses mentioned in this blog post. This is my honest opinion. I paid for the tasting with my own money.